Here are our dogs that are ready for rehoming. This webpage is updated regularly. Our dogs are all neutered and micro chipped prior to rehoming, which is included in the adoption fees of £120 for adults dogs and £170 for puppies up to and including 6 months old. Additional donations are greatly appreciated to help us to continue with our work. The next step is to arrange for the whole family to come and meet the dog. It’s best for everyone from the household to meet the dog to rule out allergies or other issues. We will then arrange to visit your home to discuss your new dog with you and answer any further questions you may have about rehoming. During the home visit, we can ensure the home is suitable and advise on preparing your home and garden, removing potential dangers, and buying food, bedding, and toys. We aim to carry out home visits within a week of the animal being reserved. You have a good understanding about the commitment involved in adopting your dog. The dog will not be left alone for more than 4-5 hours a day and will get a minimum of one 30 minute walk per day, all year round. The dog has a secure backyard or garden with fencing of a minimum of 6ft in height, although this may need to be higher depending on the size of the dog. That you are willing to take a dog to training classes/seek help if necessary. Kit is a very pretty 9/10 month female collie cross. She came into our care from the inspectors. She was rehomed recently but unfortunately has been returned through no fault of her own .More details will be provided upon making enquiries . Kit can be wary of strangers initially but is a friendly and affectionate girl at heart . She walks fairly well on the lead and travels well in the car, although she can be reluctant to get in at first. She can get a little nippy when she gets overexcited during play, not aggressive in the slightest but more puppy mouthing. Kit is a super intelligent girl . Being only still a very young dog and also having collie in her, she has abundant energy . She is looking for an active home where she will be provided with plenty of exercise as well as mental stimulation . She would benefit being taken to training classes. Kit is brilliant with other dogs, always wanting to play so could possibly live with another neutered dog . Kit is looking for a home where she will have company for the majority of time. She is still a very young dog so needs someone who is willing to put in the work with her. She could live with children of secondary school age. Sadie is a gorgeous 6 year old female Labrador/German Shepherd Cross. She came into our care as her owner had 3 young children and was finding it difficult to cope having to look after her as well. She was in kennels initially but was very stressed and quite frantic always barking and wanting attention . We decided to move her into a foster home where she has been for the last 2 weeks and she is so much happier. She is great in the home and so well behaved. Her foster parent has reported that she is very behaved at home and loves cuddles and attention. She also loves learning new tricks and is a quick and eager learner. She is also very good in the car. Sadie has a lot of energy and loves going on long walks and playing fetch. When Sadie first arrived in our care , we found she wasn't relaxed around people and dogs at close distance on walks and would often bark and lunge at them as she is nervous. We consulted a behaviourist in relation to this and her fosterer has been working with her .In a short space of time , she has already made improvements . We will pass this training programme onto potential adopters. Sadie needs to get to know people at her own pace, which doesn't take long at all we should add. She is a friendly and loving girl at heart. Sadie is looking for an experienced dog owner , one especially with German Shepherd knowledge would be beneficial. She is also strong on the lead so needs someone who is physically able to exercise her . 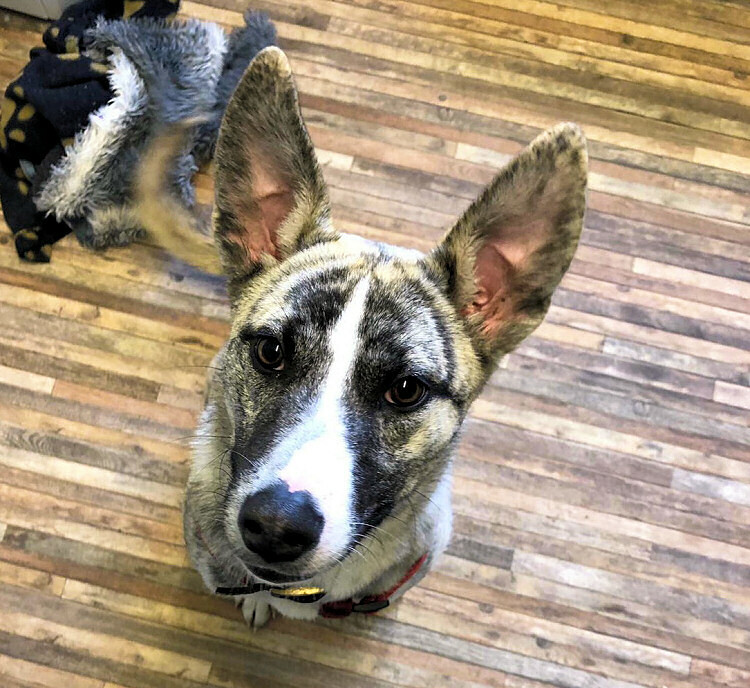 She is a lovely dog that has a lot of potential but her owner must be understanding of her and be willing to continue with ongoing training especially on her walks. All training should be positive reward based . She is hugely motivated by food which is a great help. Sadie lived with children previously but we feel she is better suited going to live with adults as she is a big bouncy dog. She is not to be rehomed with other dogs or cats.